If your looking for a Removals Company in Chesham or Amersham & you want your house move to go without a hitch it’s important that you pick up the phone today and talk to us. 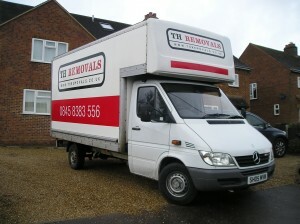 Here at TH Removals we offer a reliable, affordable house removals service. We don’t like to spend time convincing you that we’re the best – instead we let our past clients speak on our behalf. As removal companies go, we’re certain that we are a company that spends less time talking about what we can do, and more time showing you what we can do. The first thing that strikes you about TH Removals is our rates. We strive to offer low costs to our clients – after all in a time where people are looking to save money wherever possible, a lot of house removals jobs are won on cost alone. We’ll always give you the best possible rates when we quote you for a job – we won’t try and pull a fast one with ridiculously expensive quotes. Our removals firm was first established back in 2000. We’ve been serving the Chesham and Amersham area ever since – as well as large swathes of Hertfordshire, Bedfordshire and Buckinghamshire. Whether you’re moving within the same county – from one county to another, or even from one end of the UK to another, we can help with your house removal. We offer nationwide coverage for your convenience. We want you to know that we take safety and security extremely seriously here at TH Removals. We have an all risk removal insurance policy on all of our vans – this means that each load we carry is insured for loss or damage to the sum of £15,000. We also have public liability insurance cover for up to £1 million. We’re firmly of the belief that our staff make our business truly great. We don’t employ people to come up with excuses – we don’t employ people that complain. Instead we employ a team of individuals with a strong work ethic and a “can do” attitude. Here at TH Removals you can be sure we’ll always work as hard as we can to get the job done properly for you. Of course our staff are all highly experienced in the house removals industry – experience counts for a lot in our line or work, take our word for it! What have you got to lose? Call us or get in touch today for a competitive quote for your house move within the Chesham and Amersham area – we’d love to hear from you! Or simply fill in our quote form or see our pricing structure ! Find out how much you could save.